In this tutorial, we use an example where one solid state drive (SSD) and two hard disk drives (HDD) are connected to the computer, where HDD1 is configured with type LVM, and HDD2 is configured with type RAID. We will change HDD1 to type RAID, so that both HDD1 and HDD2 can be used in a RAID array. The fdisk -l command can be used to view the partition type. 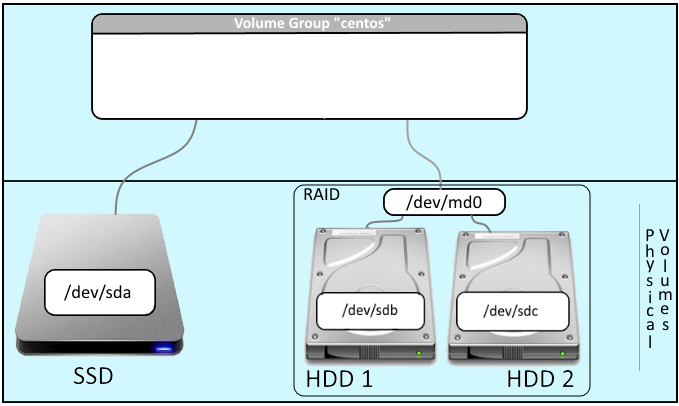 In this example, there are a variety of partition types, including an LVM partition and a RAID partition. The df command can be used to view where each filesystem is mounted. This shows that data is stored. In this example, we need to change /dev/sdb1 from Linux LVM to RAID. First we need to remove /dev/sdb1 from LVM. Use the pvdisplay command to view the LVM physical volume. In this example, /dev/sdb1 is an LVM physical volume. Display information about the current volume group. Notice the volume group name is centos, and notice the free size is 0. 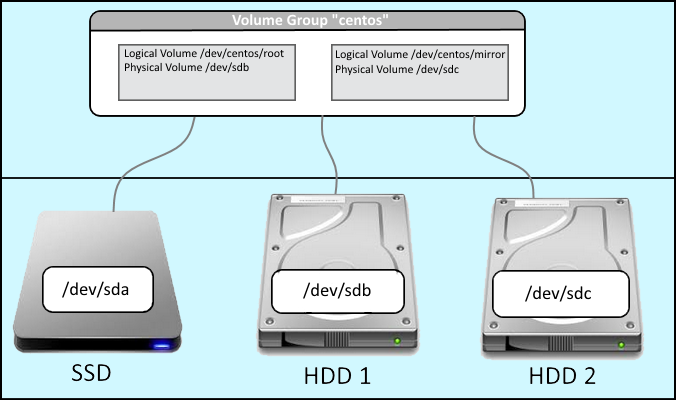 Add the /dev/md0 physical volume to the volume group named centos. View the volume group again, and notice the volume group size has doubled and the free size is now 2 TB. /dev/sda (SSD), /dev/sdb (HDD1), and /dev/md0 (HDD2) are now members of volume group "centos." Now we move the /dev/sdb physical volume into /dev/md0, so that both /dev/sdb (HDD1) and /dev/sdc (HDD2) are part of /dev/md0. Display information about the current logical volumes. The lvcreate command with the -n or --name and -L or --size can be used to create a new logical volume. In this example, a new 2TB logical volume named MyLogicalVolume is created in MyVolumeGroup. lvscan shows a simple summary of the logical volumes. There is now a logical volume /dev/centos/root which used 2TB of capacity from physical volume /dev/sdb. Also, there is a logical volume /dev/centos/mirror which uses 2TB of capacity from /dev/sdc. Determine the file system type for the first HDD. In this example, the first HDD is using the ext4 filesystem. Use the same filesystem type for the second HDD. In /dev/centos/mirror, "centos" is the name of the volume group, and "mirror" is the name of the logical volume. fdisk -l should now have a listing for /dev/mapper/centos-mirror. Add an entry to /etc/fstab. Both the first HDD (/dev/mapper/centos-root) and second HDD (/dev/mapper/centos-mirror) should be listed in the output of the df -T command. "A Beginner's Guide To LVM - Page 6 - Page 6." A Beginner's Guide To LVM - Page 6 - Page 6. HowtoForge, n.d. Web. 26 Mar. 2016. <https://www.howtoforge.com/linux_lvm_p6>.